In the early spring of 2009, I began a love affair that has proved enduring enough to now no longer be considered a fad within my household. I can pinpoint the exact date that I fell in love with and married social media. Genius, it’s not, but almost 6,000 tweets later I’m still trying to convince myself of that interest level and still passionately love social media - maybe now more than ever. Previous to my Twitter account going live, I had a family blog and a Facebook account that I used primarily for my own entertainment but hadn’t put much thought into the future of these mediums in relation to business strategy. 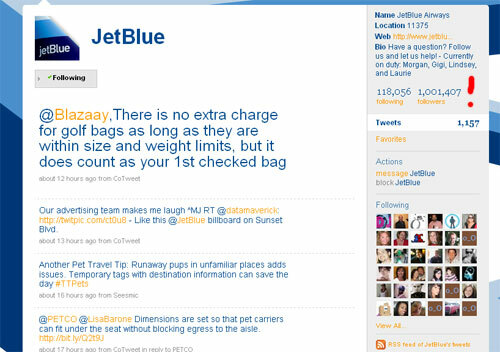 At the time, I was working in the frequent flier (TrueBlue) department for JetBlue Airways and was sought out to assist the company’s Corporate Communications team (specifically @MHJohnston) with their young @JetBlue Twitter account. Twitter for business was still relatively young and the trails and precedents were still unpaved. It became quite evident once I was contacted for this project and had set up my own personal account, that I had a huge learning curve ahead of me. I’ll leave out the gooey love story, but I fell head over heels. Hard. I was only scheduled to work part-time but I poured over the @JetBlue Twitter account (there were only 4 of us on the team at the time) for hours and hours and hours, easily doubling (maybe even tripling) the hours that I was technically “supposed” to be working. I couldn’t tear myself away from the constant feed. I adored answering customers, making cheeky comments, and solving real-time issues. I felt as if I was making a difference (even though it was partially indulgent) and could see it all unfolding in front of me each day. It wasn’t long before our follower count grew from a few hundred thousand, to close to a million, then over that milestone. For a few years I don’t think I spent more than 10 minutes thinking about anything else and my passion was insatiable. Time passed and the demands of an audience that never slept and an increasing recognition of our platform and approach definitely took a toll on our small Twitter team. Along with our other “real jobs” and responsibilities from JetBlue, we were all carrying a heavy load. Why the sappy journal entry? What’s my point? From then, even up until the present time, I’ve been attempting to redefine my place in social media. It’s obviously not going away, nor is my intense devotion to it. It has very clearly proved it’s importance in business, marketing, and overall commercial strategy, as well as the opportunity it presents as a unique engagement and relationship building platform. I’ve watched from afar as peers and associates attended conferences, classes, meetings, and events. Because I was no longer associated with any one particular brand, I didn’t necessarily feel I had the ‘right’ to attend these events. I was just ‘the little guy’ - without any sort of name for myself - how did I fit into these things? I’ve watched from a distance (which is easy to do these days via Twitter, Facebook, and Instagram) and wished I could justify the involvement. Luckily, semi-recently I had a lightbulb moment. I remembered something! Social media is still NEW. It’s still growing, evolving, changing and we can each still step in with something to offer and because of the nature of the medium, it’s easier than ever to learn and influence each other. Our backgrounds are all over the board. Our motives and intentions vary just as much, BUT the one thing we do all have in common is that, in the grand scheme of things, we’re all somewhat new at this. Because I’ve come to grips with the fact that I can’t separate myself from social media, I’ve had come to grips with the fact that I need to get involved - most specifically - to connect with others like me. It doesn’t take long, if you’re in those social media circles to hear mention of the “life changing” nature of conferences - the pinnacle being Evo. Because I’ve already come out and admitted that I don’t necessarily know exactly where I fit into all of this, the conference scene concept is exciting but also incredibly intimidating. Because I’ve committed to Evo this year, I need to put on my ‘big girl pants’ and find a sensible approach to dealing with my anxiety. After some thought, I decided that I’d do exactly what the 5th grade version of me would do - I’d interview someone with much more experience than myself in order to learn the Evo conference tricks, tips, and advice of someone much wiser than myself. My new friend Jenny Eckton (@formerlyphread) graciously agreed to give me the skinny on Evo. I hope that her answers are just as helpful to you as they are to me. 1. How many years have you attended Evo? Why do you keep coming back? I’ve attended evo since its first year. It’s convenient for me (because I can drive there), but more than that, it’s the best conference I’ve been to. From the speakers, classes, and workshops to the activities and accommodations: it’s world-class, all around. 2. How were you introduced to Evo? I saw people talking about it on Twitter (this was in 2010) and knew of a few people who were going. I carpooled and roomed with locals whom I didn’t know until Evo, and we’re all still friends today. 3. Why do you think it’s important to attend? Do you have a goal for attending? I think it’s important for anyone who needs help or inspiration in any realm of social media to attend. The creativity and support found at Evo are outstanding. My goal for this year? Well, I get to be one of the Ignite speakers, so my goal is to make my contribution to that session up to par with everything Evo represents. 1. During a meal, look for a table with people you don’t know; approach and ask directly if you can sit with them. 2. Find a few people that have influenced you and tell them about it. Don’t be afraid to approach them to share that. 3. There are obvious times to connect but utilize extra times like those times you’re in shuttles, elevators, and on chair lifts. Put your smile on and open your mouth. Connection opportunities abound. 5. How do you make real connections there? It seems obvious, but it’s so important to be genuine. Once again, open your mouth. Take your time, whether it’s talking to other attendees to or the sponsors. 5. What’s something you’d never ever see on a packing or prep list that you absolutely recommend an attendee bring? Extra space in your suitcase. 6. In addition to that, name 3 of your “must haves” for Evo? 2. Lotion, sunblock, and a water bottle - Park City is high and dry. Stay hydrated! 3. A light jacket - because Park City is so high, it can get chilly at night, even if it’s scorching in the day. 7. What advice would you give to someone that’s never attended a conference before? Be proactive! Like I mentioned before, If you see someone who has made an influence on you in the online realm, tell them. Reach out to others, including the sponsors. Make a point to spend time in the Sponsor Suites. 8. Is there any unspoken conference etiquette that we need to be aware of? Not necessarily, but there are a few things I’ve observed. When you’re interested in getting someone’s business card, simply ask them for it. In reverse, simply ask, “May I give you one of mine?” Don’t just dole out cards like playing cards to a group of people around the table. Be conscious of the approach you take in handing them out. Also, visiting the mentioned Sponsor Suites will certainly provide you an opportunity to score some swag. Be sure to mind your manners. Don’t just grab all the free stuff you can manage. Be conscious of your fellow attendees. 9. Tell us three phrases that describe Evo for you? If you’re anything like me when reading through these insights, you’re feeling a bit less nervous about Evo already. Prepare yourselves now to engage, retweet, reply and respond. Make a goal to meet new people and step out of your comfort zone. Do your homework. Join in the pre-Evo Twitter chats and take advantage of the Evo pinboard designated for the 2012 Evo Attendees: http://pinterest.com/evoconference/2012-attendee-blog-roll/ These are great methods we can all use to break the ice before we even arrive, but most importantly, do what Jenny says: Mind your manners and open your mouth. Thanks for the EVO tips... this year is my first time going and I want to make the most of it! Let's hang together, shall we? You bring the crackers, I'll bring the cheese. These are awesome tips! I love Jenny. She is so right about just opening your mouth. This will be my second year at EVO and I am so excited. Can't wait to see you there!! I usually go with WWJD - What Would Jenny Do :) See you soon! Oh I wish I could go! Next year for sure. It simply can't and won't be the same without you. Love this post!!! Love you both and I cant wait :)!! Looking forward to meeting all the newbies. I'm an old-timer, this will be my third EVO and I'm sure it will be even better than the other two. Don't be a wallflower, just jump in and dance. Everyone will think you are brave and awesome, which will be exactly right! Thanks for the advice. Can't wait to test my courage. Great post! I'll be an Evo newbie and do already feel a little bit less stressed. : ) look forward to meeting you! Fabulous post Lindsey! And Jenny! I'm excited to put all these tips to good use! Totally. When in doubt, just ask yourself. What Would Jenny Do? Great post and tips! I'm a newbie and cant wait to go and meet everyone. Got new cards, light jacket, just worried about the extra room in my suitcase. I'm going to try to pack light, but you know how that goes. I've been to Blogher Food conferences before and enjoyed them but kept pretty quite. This time I'm going to open my mouth!! !I'll be looking for you Lindsey. I cant go this year but it was an interesting post. I am curious though, is this thing for families? Bc looking at the agenda it looks like some of the stuff is for families/kids and I dont have kids so I feel like I wouldn't fit in or be able to do that stuff. Also, is there any way (too late now) to pay for just coming for one day? Maybe blog conferences just dont do stuff like that. Thanks.